It is not clear why Kriseman would opt to keep Gibson around. St. Pete Mayor Rick Kriseman decided this week to fire Water Resources Director Steve Leavitt and retain his boss Tom Gibson "demoting" him to a $120,000 per annum position as engineering-transportation manager. Kriseman's comment is sort of political of double speak. If Gibson is an "engineering-transportation manager" but has no "leadership" role what does he do? Probably what he has done his entire career at the City - very little. 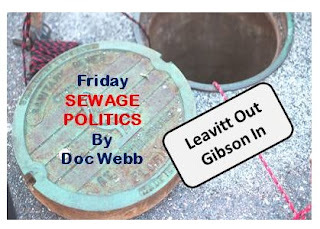 According to the consultant's report, "Neither Water Resources Director Steve Leavitt nor Engineering Department Director Tom Gibson tried to keep elected officials in the dark about a 2014 report that indicated the city’s sewage system was at the risk of massive overflow" but it appears neither took any aggressive action to make it known. Keeping Gibson around is a little like asking your Oncologist to leave a few of those cancer cells in there so you will know how it feels. Gibson is no leader, and his presence in the department sends a bad signal to all the other employees and presents a major obstacle to anyone who takes over the Public Works leadership role. Maybe Gibson knows something, and this is a good way to keep him quiet. Gibson is a protégé of Mike Connors maybe a quid pro quo with Connors. Avoid possible legal action resulting from the unpaid leave. Maybe Kriseman is looking to buy himself a mole over in public works, if so he just wasted $120,000 of the taxpayer's money. Kriseman did not solve a problem, he just created a new one that will come back to bite someone in the future. A clean sweep here would have allowed the new Public Works leadership to make significant changes, improve the professionalism at all levels in Public Works and not have to watch their back at every move. Once again, Rick Kriseman has proven that as a manager, he is a better politician.